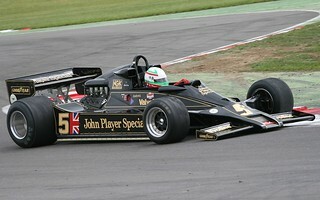 Taken at the Lotus Festival, Snetterton 19th June 2010. The Lotus 79 was a Formula One car designed in late 1977 by Colin Chapman, Geoff Aldridge, Martin Ogilvie, Tony Rudd and Peter Wright of Lotus. It is considered by many the most significant and respected racing car design of all time. It was powered by a Ford-Cosworth DFV, 2993cc V8 engine that was naturally aspirated and longitudinally mounted. The car was nicknamed 'Black Beauty' for its graceful design and black / gold livery through sponsorship by John Player Special cigarettes.